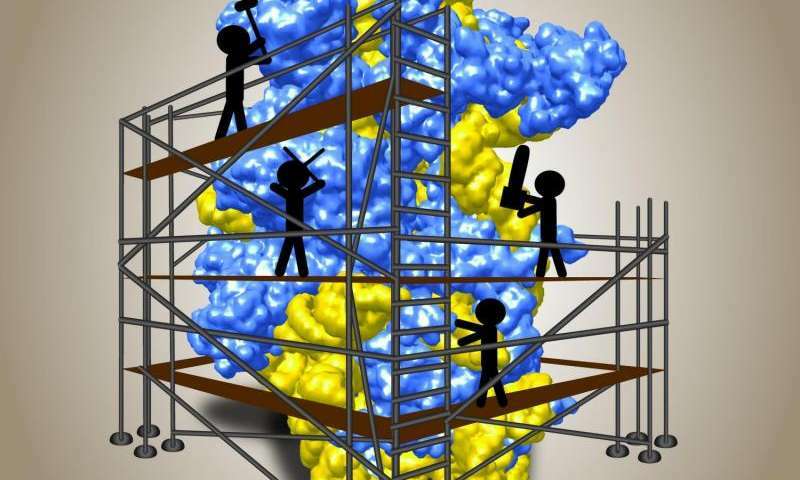 A type of scaffolding on which specialised workers ply their trade helps in the manufacturing process of the two subunits from which the ribosome – the protein factory of the cell – originates. Biochemists at Heidelberg University discovered it after succeeding in getting a peek into the ribosomal "birthing room". While studying baker's yeast as the model organism, the researchers, in collaboration with colleagues from Ludwig Maximilian University of Munich, discovered a shell that envelops the smaller of the two subunits during the ribosome's formation. The results of the research could contribute to a greater understanding of ribosomopathies – abnormalities caused by impaired ribosome biogenesis. Because several medications also act on the biogenesis of ribosomes, the investigators hope to apply their findings to cancer research. The results of the research were published in the journal Cell. The research team of Prof. Dr Ed Hurt of the Heidelberg University Biochemistry Center had already stumbled on the earliest known ribosomal precursor, the 90S pre-ribosome, 15 years ago. To find out the function of this giant precursor particle in ribosome biogenesis, Markus Kornprobst isolated the pre-ribosomes of baker's yeast in order to analyse their structure. "In the process, we discovered that the precursor bore a large shell-like module that the cell recycled after work was finished," explains Markus Kornprobst of Prof. Hurt's team. "The relatively compact phenotype of the 90S pre-ribosome gave us the idea that this shell, in combination with other factors, encloses the smaller of the two ribosomal subunits during biogenesis to allow seamless assembly of the particle in a protected environment." Using cryo-electron microscopy, they were able to confirm their suspicion in collaboration with the Munich team of Prof. Dr. Roland Beckmann. Another member of Dr. Hurt's lab, Dr Nikola Kellner, isolated the 90S pre-ribosome from a heat-loving fungus. "They are more stable and hence better suited to further analyses than 90S pre-ribosomes from other organisms," Nikola Kellner explains. Finally, with the aid of cryo-electron microscopy, the structure of this thermostable 90S pre-ribosome was detectable down to a resolution of less than a nanometre. "The 90S factors actually form a gigantic cohesive network that surrounds the small developing subunit like a scaffold, such as on a high-rise, where specialized workers perform their jobs using various tools," explains Ed Hurt.